Lunch Monday Through Friday 11:30-14:30. Closed on Saturday. Savour some of the choicest international cuisine at the best buffet restaurant in Phnom Penh. Inspired by the emblematic Parisian Brasserie La Coupole, our stunning wood panelled and high ceiling restaurant is the perfect place to indulge with friends and family. 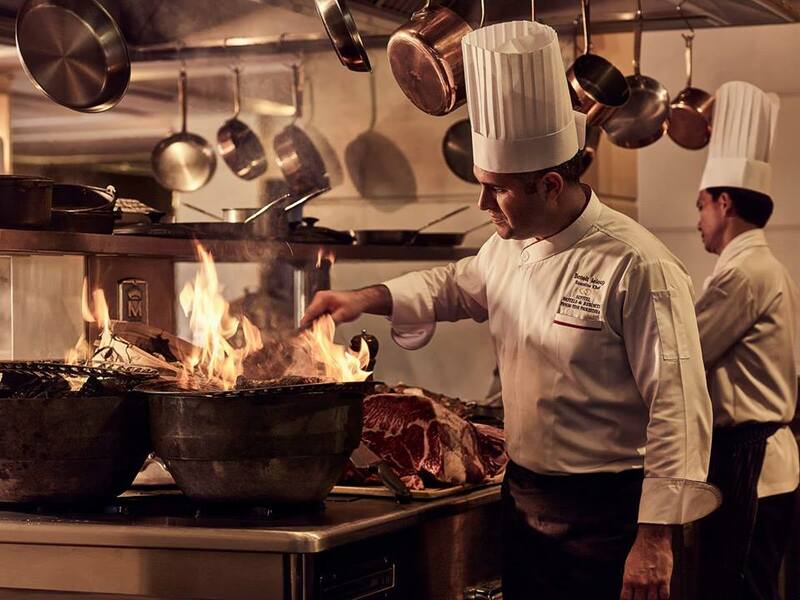 La Coupole offers an unmatched selection of culinary artistry accompanied by a large collection of fine wine and champagne. Overlooking the swimming pool, the restaurant is a relaxing place by day and by evening. 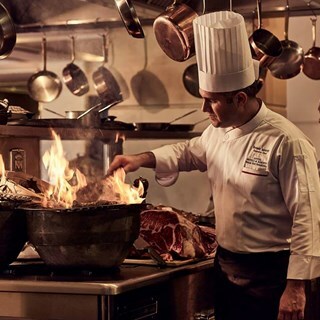 The show kitchen and the live cooking stations create a gently bustling atmosphere where you can enjoy a barbecue, seafood buffet, Sunday brunch with free-flowing champagne, or whatever else is your desire. More than 100 wine labels are on offer for you to toast your stay in this beautiful city. Service was great this time. The food was awesome, as usual. Very very fresh! For recommendation a lot of people can’t afford it unless a really special occasion. It was great to have a special cake for a birthday. I had a great dinner at La Coupole but wasn't expecting it to be a buffet. The food was good and the service was great but i wanted a more intimate dinner not a buffet style dinner with children running around. A good place to go but not if your looking for a romantic night out. We came here many times before, and the food was always of great value and fresh. Before however, there was always something that did not go right, eg not enough service, etc.., but this time, everything was perfect. I want more food, buffet is should include with drink. This buffet is expensive and have no drink. The band was gorgeous; singer exquisite; I would have enjoyed some Mirriam Makabe sounds as well as the jazz provided. I remember being in Sofitel in India, and the singer sang Makabe songs; it was something else and everyone was fascinated by the sound of Makabe presented by the Christmas jazz band. All amazingly stylish and discreet and respectful service. Maybe more plants to absorb the noise that some  think necessary to identify as masculine, when eating out. This place supply many kinds of seafood & meat cuisines, the most recommend dishes are any kinds of BBQ seafood & lamb chop, taste awesome and fresh, cannot really resist the sweet lobster meat. But for the cooked Boston lobster pliers are super salty, almost impossible to eat... hope they can improve on this case, and the boiled seafood area seems not so fresh after all, please also improve on that. As for the costing for each person will be 42$+17%tax, glass of wine would be 5$ for each. We had a dinner reservation at 6PM. The maitre d'could not find our reservation and gave us a table in a corner. That is probably why the service was poor. We had 7 plates on the table at one point, without any waiter clearing anything. I had to ask the pastry chef to call a waiter for us to help clear the table. After a few minutes of wait, he came and cleared it himself. He apologized that there was a lack of staff that day due to people being sick. We cleared our tables again the next round after trying to get the attention of waiters for over 5 mins without success. Overall, the restaurant is great in terms of food and ambience, but service was not. The experience was much better than the last one. More food was prepared when we got in around 6:00PM and ready to be eaten. The atmosphere was good overall. I did not give full marks bc there were many large crowds, but that is not the restaurant's fault. Seafood was very fresh as last time. The seafood was fresh. However as we had the 6PM reservation, many dishes were still cold, such as the peking duck, and we had to take the wrappers off the sushi plates ourselves. It could have been better prepared. The service was a bit weird at first. The waitress gave us a menu that showed the Canadian lobster, and beef were additional charge to the buffet. Yet as we finished the meal and were full, I noticed other guests filling their plates with Canadian lobster. When I asked the grill chef, he confirmed it was part of the buffet. A shame to have missed out on those dishes. The food is good but not much as you said. I'm very disappointed with what you have said in promotion is different from real . This was a last minute booking for my wife's birthday. The staff were amazing and looked after us so well, even bringing out an unexpected cake at the conclusion of our meal. The quality of the buffet was excellent. We would certainly recommend this for a special evening out. Good with food but drink price a bit high,in general Yes,I will go back and recommend friends. We had the Friday evening Seafood buffet. Amazingly, the "Seafood" buffet now does not have sashimi. How a seafood buffet cannot have sashimi is beyond me. The rate for an adult with free flow is not bad compared to other places. However, the price for children is ridiculous - 50% for a 6 year old? Really???? Thank you for an enjoyable lunch! Generally OK.. but wish to see more varieties of foods. Table staff exceptional. Friendly, attentive, professional. Extra special mentions for Ms. Votey and Ms. Sanna! Visited last night, wonderful night here, fantastic food and great service, everything was just superb, especially the friendly and courteous staff. Decoration is not match with Sofitel standart. When we arrive in lobby we expect to find something with the same level in the restaurant. When I booked your Seafood special dinner buffet table by online, I clearly mentioned I need buffet and free flow beer and wine. But when I was seated on table, surprisingly they showed me menu and asked me what would be my choices. I told them "as I already booked, the buffet with free flows, please" Later I realized why they showed me the menu. When I asked for beef steak, they said  I have to pay more, when I asked for some food which I can not find in the hall, they said, I need to pay more...Question !! IS THIS WHAT YOU CALL BUFFET ??.. YOU SHOULD HAVE ADVERSTISED CLEALY "Buffet but beef is not included and some food is not includes as well" so that I would not even try your surprising BUFFET from the beginning...VERY DISAPPOINTED.. "BUFFET"